Glossy Photo Insert (outer) of "Mad Mike" Metrovich. That's Ronnie Haig's guitar case in the lower right corner, not one of Mad Mike's famous home made speakers as some have suggested. Mad Mike described the evening's broadcast as "Pittsburgh Music History"; we couldn't agree more! Promo-only CD-R contains four tracks and runs 79:53. Five copies for in-house use and thirty-seven consecutively-numbered copies (one for each year Mad Mike was in radio broadcasting) were produced from JAN CEE MUSIC's aircheck tapes of the evening (almost 3 hours!) to coincide with the release of three new albums of Mad Mike Monsters. Although not officially distributed at Norton's record release party in Pittsburgh (plan A), The Attic record store is helping to distribute the two dozen remaining copies to the many guest DJs who spun those fantastic sounds all evening at Pietro's Pizza Pub. Wherever you are, Mad Mike- Sorry it took me so long to make a "record" of the show! Matte folded insert (inner shown). The cover photo was repeated on the outer side of the heavyweight insert to allow removal of the glossy photo insert for framing. 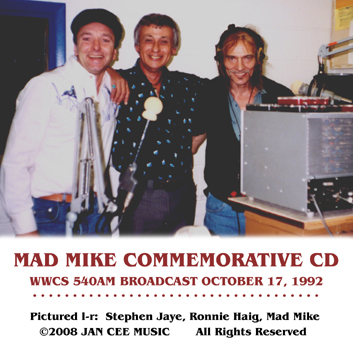 Although JAN CEE MUSIC is co-author of portions of the broadcast (by virtue of a "work-for-hire" arrangement with Ronnie Haig) we chose to issue the commemorative CD-R as a free home recording of a public domain radio broadcast. JAN CEE MUSIC encourages owners of one of the original CD-R's to freely distribute its content to other collectors. However, JAN CEE MUSIC Publishing (BMI) does claim copyright protection for the original photos and graphics, CD-R label design, and the edited presentation of the full broadcast tapes. The audio contents of the Mad Mike Commemorative CD-R are not intended for re-broadcast or any other commercial use whatsoever. 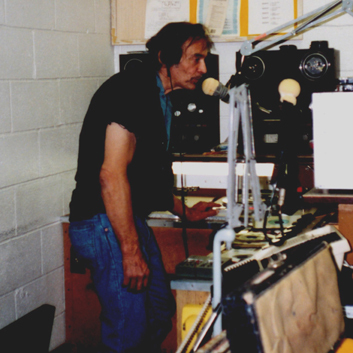 The above link offers a three and one-half minute sample of a second on-air interview Mad Mike did with Ronnie Haig throughout that evening's broadcast. We originally thought he'd have us do our 15-minutes and then exit the studio- Wow, were we wrong! Listeners to the full CD-R can also enjoy almost an hour of great Mad Mike Moldies plus studio chatter, airchecks, and all the "warts" associated with an authentic Mad Mike radio broadcast. Always the engineer, Mad Mike steadily improved the broadcast quality (and volume) of the show during its first hour with some deft re-configuration between the extra microphones and studio mixer- All the while spinning those precious two minutes of madness! Note to all visitors- Please feel free to copy and share the cookie/ad-free 1.6M sound bite sampled from the Mad Mike Commemorative CD-R! We also wish to remind everyone that the images and text contained throughout this website are copyrighted intellectual property and ARE NOT to be used or shared without permission. Feel free to email the author with your request at: stvnj@janceemusic.com . Permission for non-commercial usage is usually free and we'd really hate to spoil the reference photos with an annoying copyright notice overlay.